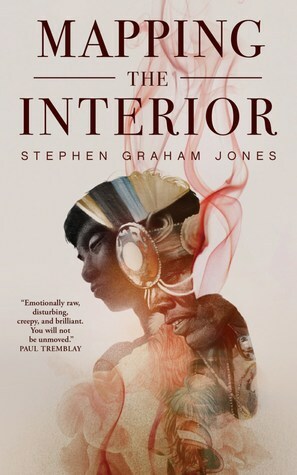 Thanks to Tor.com and the author for an ARC of ‘Mapping the Interior’ in exchange for an honest review. Receiving this ARC in no way influences my thoughts or opinions on the novella. Once again, Tor.com catches my eye with a gorgeous cover and a blurb from one of my favorite horror writers, Paul Tremblay. A young man of twelve wanders through his modular home under the cover of night and believes he sees his father stepping across a threshold into another room. Searching tirelessly over the course of the next few days, the boy discovers that what he saw wasn’t a trick of the light when he finds a bead from his father’s headdress hidden in a corner of the house. He decides to map out his home to find out where this manifestation is coming from, and ends up putting his brother’s life on the line in the process. I started this novella last year when I first received it from Tor on the heels of reading and loving SGJ’s ‘Mongrels’. To be honest, I couldn’t get into it. It sat…and sat…and sat on my bedside table for over a year, collecting dust and giving me the side-eye for neglecting it. But when my wife and I took our vacation, I thought to bring it along and give it one last shot before shelving it as a DNF. What starts out as a slow burn, what with our protagonist mapping out his home and trying to find clues to his father’s sudden appearance, turns into a race against the clock as this manifestation begins to feed on the lives of those around it. This novella turns downright eerie around the halfway mark and becomes unputdownable until the end. Think of it as a coming of age story with ghost/psychological horror elements thrown in. It is a novella that will move you in ways you can’t comprehend and will resonate with you for days after you have finished. I don’t know how SGJ does it, but I applaud him. I highly recommend ‘Mapping the Interior’ if you are in the mood for a quick horror tale or if you have read any of SGJ’s previous works. I mean, it was nominated for a Shirley Jackson award! Good news is, Tor.com novellas are pretty cheap to purchase, so if you don’t like it as much as I did, you are only losing a few bucks.